Over the course of the last seven months the body of Christ has been gathering in regional expressions of unity to worship the Lord together and to pray for revival in our state. An overflow crowd of 2,000 packed the Shubert Theater in New Haven to worship and pray for three hours! The Rome Ballroom on UCONN’s campus was filled with students and area believers to pray for revival at the university. Called 7NOW/CT—seven nights of worship for Connecticut, this has been a grass roots relational movement of seeking the Lord. Momentum is building to see a move of God in our state! Now an eighth gathering has been planned for February 22 at 7:00 PM at The First Cathedral in Bloomfield. 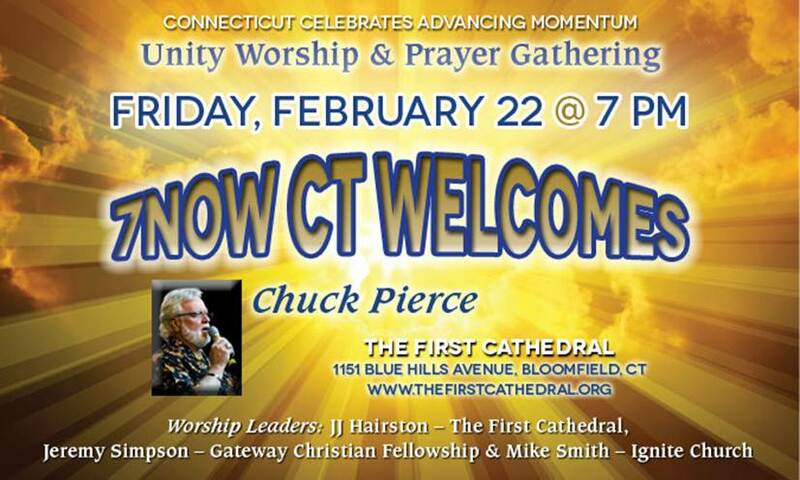 Prophet Chuck Pierce, who has been used by God as a voice to the nation, will return to Connecticut for this gathering. It was a prophetic word from Chuck released on June 9 to a similar gathering that launched the vision for 7NOW/CT. Come to The First Cathedral on Friday, February 22 at 7:00 PM for a night of united, cross-cultural worship; for prayer for our state; rand for a fresh word of encouragement for the advance of the Kingdom here in Connecticut.